Co much care did the old masters give to the cultivation of a correct breathing method for song that the above sentence has come down to us as the basis of all their teaching, for it must be remembered that the art of singing had not in those days received the attention of physiologists, and was not really understood to be a science as it is now. So if the great singers of past days were produced with the slender knowledge then extant of actual processes, and if masters of those days based their teaching on breath control, that were a proof, if proof were wanting, that the act of breathing is the foundation of all song. The sentence at the head of my article is somewhat misleading, as many other things than breathing, capacity are required to make a singer; but it is useful in drawing attention to an indispensable part of the singer's education, which is often strangely neglected by the teacher. Now, I always impress very strongly upon my pupils that breathing exercises are to be considered and studied apart from the act of singing. Nothing is more fatal to the student, during the delivery of a song, than having the mind occupied with several things at once. Is my breathing correct? Is the production right? Am I singing in the right register? And so on. The result is general constriction and an unsatisfactory performance. The breathing exercises must be looked upon as a thing separate. They ought to be kept up throughout the singer's career, and in the course of time a control will be set up that becomes purely automatic, and direct muscular exertion totally unnecessary. These exercises, being independent of sound, do not tire the voice. (This was made a strong point in a conversation I had in his studio at Frankfort with the late eminent teacher Julius Stockhausen.) But it requires much practice to reach this point of perfection. A common mistake among singers is to imagine that an enormous amount of breath is necessary for the production of a full tone, and, lacking proper control, they completely fill their lungs with air, with the result that the tone they produce, instead of being supported by a steady flow of breath. is overwhelmed by a totally unnecessary rush of air, the sound being "breathy" and without any resonance. Breathing, as we all know, is composed of two processes - inspiration and expiration - and the second is far more difficult than the first. It is not so much the amount of breath inhaled that matters as its control. Without thorough command of the muscles of expiration sustained singing is impossible. 1. The clavicular, or collar-bone, breathing. 2. The lateral costal method. 3. The diaphragmatic method. I do not propose going into a full explanation of these three methods, for, as I said in my first article, I never approve of confusing the pupil's mind with physiological reasons, besides which the subject is fully treated by several writers both from a medical and from a singing point of view. Even to-day there is considerable dissension among authorities on these points, and no good purpose is served by the student confusing her mind as to the why and the wherefore of all statements made upon this subject. Clavicular, or collarbone, breathing is a method which I condemn emphatically and at once. Untrained girl students, especially those who curtail the freedom of their bodies by the use of corsets, often rely entirely upon this system. By its employment the shoulders are raised, which is not only quite unnecessary, but also very unsightly. Further, an effort is made to move the highest ribs. The part of greatest expansion is entirely shut off, and the result is a constriction of the throat muscles, a hard, unsympathetic delivery, and very often that bane of modern singing, the tremolo. Now, what we seek to acquire is a method that will give us the means of inhaling the largest quantity of air with the least expenditure of effort, in short, a combination of all methods. Here I must draw your attention to a point of the greatest importance. I refer to what I may call the singing position, or poise, of the body. Always pay attention to this during your breathing exercises, as it will become a habit when songs have to be sung, and when the whole attention has to be given to the rendering. But on this point more anon. No tight garments, especially in the region of the waist. Pure air is essential; do not be afraid of open windows. This advice is so very common nowadays that I need not enlarge here upon the absolute necessity for everyone, and especially singers, to avoid stuffy and ill-ventilated places as much as possible. Do not practise too soon after a heavy meal. The best time is in the early morning, clad in some light body garment that does not confine free body movement. And do not practise the exercises in the company of other students. Be quite alone, otherwise you may try to compete with each other as to who can hold and retain the greatest quantity of breath. And this, especially in the early stages, may result in harmful strain. Stand upright, with the feet firmly planted on the ground, in an easy, natural attitude. The shoulders must be drawn backwards, and should slope downwards. The head should be held erect. The tongue should be flat, and all the muscles of the throat and neck must be loose. This last point is one of the most important of all for singers to cultivate. Never, under any circumstances, must there be any tightness, I would almost say "consciousness," of these muscles. Spasmodic practising is useless. Exercises need not be done for any great length of time - never until a feeling of fatigue is reached. Regular, thoughtful practice of a few minutes daily will be of more permanent benefit than an intermittent excess of zeal. Exercise i. Maintain the easy, correct poise of body, inhale slowly and steadily through the nose. Place the hands against the lower part of the chest and feel a gradual expansion. Do not take in an excess of breath or feel any strain. Then, after mentally counting four, allow the breath to escape forcibly through the mouth. As the breath is expelled, a sudden collapse of the muscles will be felt under the hands. Let this be a very strong mental impression. By this means breathing will in time become practically a matter of will, and then automatic. Do this exercise five times consecutively. Exercise 2. Following the same directions as in Exercise No. 1, inhale quickly and silently, not too rapidly at first, but increase the speed until a quick, silent breath can be taken. Exhale quickly through the mouth. Never move the shoulders. Also remember that the expulsion of the air is controlled by the muscles in the lower part of the chest which press out the air; it is not the escape of the air that allows them to resume their normal positions. Exercise 3. 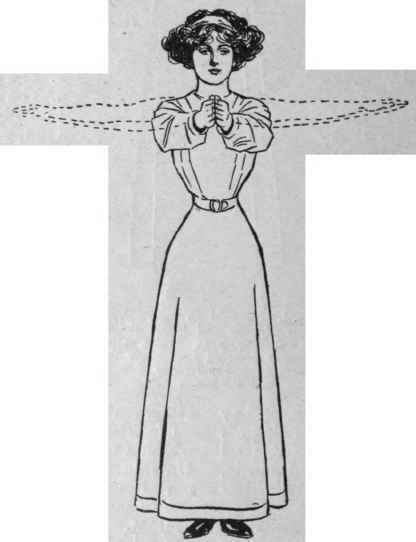 Stand erect, with the arms held out in front of the body at right angles and the fingers touching. Draw the arms back slowly until they are on a level with the shoulders, at the same time inhaling quietly and slowly. Then return the arms to the first position, letting out the breath in a steady flow, in time with the movement of the arms. Do this a few times in succession. 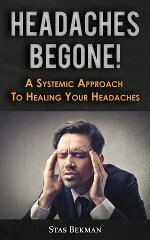 A great deal can be accomplished by mental concentration, and particular attention should be directed towards keeping the throat, neck, and mouth, and all surrounding parts in an elastic and free condition. Take a breath very slowly through the nose, following the directions in the first exercise; hold it for a few seconds; then, with the hands pressed against the lower chest muscles, exhale very gradually through the mouth, making a strong effort of will to resist a too sudden outflow of air. Mentally count, say, from one to five as you are doing this, and increase the time up to, say, twenty seconds. It is most important in these exercises and in singing that the upper chest should never be allowed to fall in.